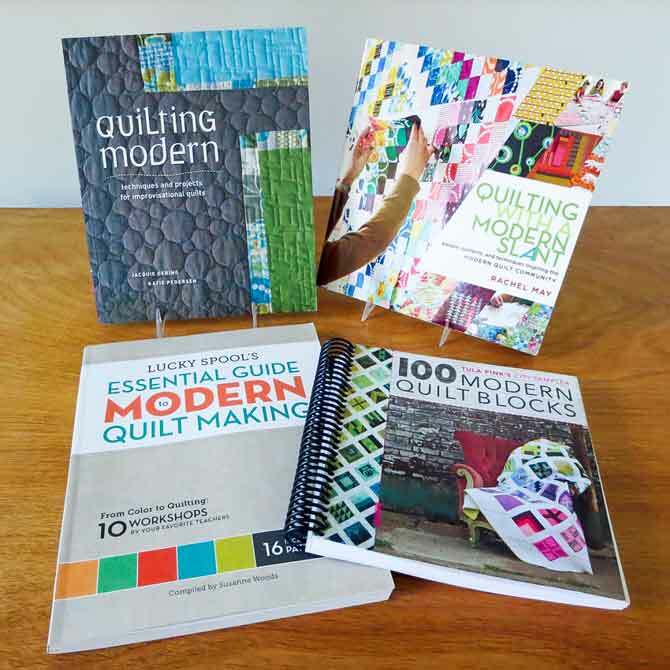 Modern quilting – what’s it all about? Are modern quilts really so different from traditional or art quilts? Everyone has his/her own definition of modern quilts, but there are a few techniques and styles that seem to appear in most of them. Are you ready to make it modern? Let’s see if we can learn more about this relatively new genre of quilting. 5 elements for modern quilt making to help you with the process. Modern quilts began to appear on web sites and blogs just a few years ago. Interest was high and with the ease of using social media, modern quilters were able to see what others with similar interests were creating. Modern Quilt Guilds were soon formed and many of them have on-line sites as well. Do a Google search for a Modern Quilt Guild in your area and you’ll probably find one! Many books, magazines and patterns for modern quilts are now available. Check out your local bookstore or on-line source and you’ll find a long list of them. Here are a few of my favorite books. Let’s look at some general guidelines for modern quilt making. Modern quilts tend to have more negative space, or background, around the pieced or appliqued elements. 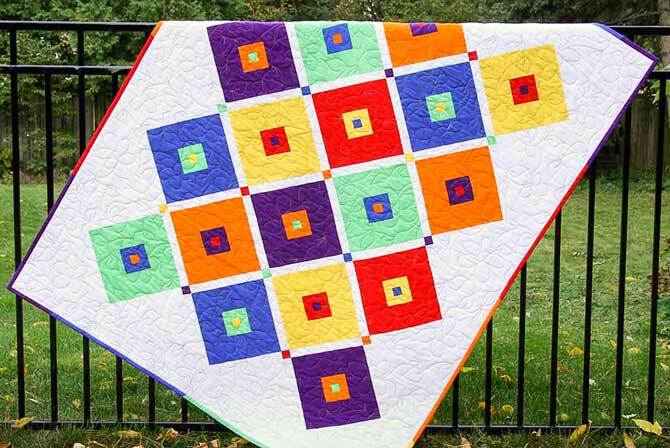 These negative spaces also allow you to showcase your quilting designs. Simple shapes and fewer blocks are commonly seen in modern quilts. Modern quilts often feature off-kilter or not-quite-square blocks or designs. Improvisational piecing is very common. Fabrics with stylized flower shapes, bright, clear colors and over sized geometric designs are found in many modern quilts. Solid colors are also used extensively. To get a feel for these great fabrics, check out a few of my favorite designers: Jane Sassaman, Amy Butler and Kaffe Fassett, to name just a few. Straight line quilting, echo quilting and graphic designs are often found on modern quilts. But the quilting style is definitely not limited to just those designs. Be brave and try something new and different for you! To give you a feel for modern quilt making, I’ve designed some place mats with a modern look. Here’s your chance to make 4 small “quilts” and learn something new! I chose to make my place mats with solid colors, but of course you can use whatever makes you happy. It’s all part of modern quilt making. I had small pieces of fabric left over from my Fiesta quilt. Just the right amount for my place mat set! Come back tomorrow to get all the instructions for place mat #1 and use the 5 elements for modern quilt making. Modern quilting is what got me interested in making quilts. I love everything about them! I’m glad you featured Tula Pink’s 100 Modern Quilt Blocks book. I made all 100 of them and enjoyed making all but one of them! I love modern quilt designs – the bold colours and interesting shapes and designs. What a striking design. Beautiful! Glad you enjoyed this post on QuiltSocial! Hi, I am new to your site and am loving it! I am 78 and keeping busy is what I do, I piece, quilt, sew, crochet, and knit to name a few. there is just so much to see and learn. Your site looks like it has it all! Welcome! Glad you are enjoying the site.